“Walks in the Dark” from Christian Faith Publishing author Michael Campisi is an intense story in memory of sixteen-year-old Maverick as told by the author, his father, as the family struggles in the aftermath of the tragic loss of their youngest child, processing the details to come to terms with Maverick’s suicide, his impact on those around him, his short but beautiful life full of friends and laughter, and the devastating prospect of the rest of their lives without him. “Walks in the Dark”: an intimate memoir in the wake of a son’s suicide. 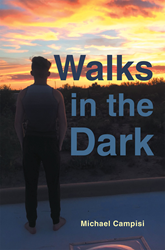 “Walks in the Dark” is the creation of published author Michael Campisi, a business executive based out of Oro Valley, Arizona; he is a Christian family man, husband of twenty-six years and father of three, who enjoys early morning walks in solitude to look at the stars. Published by Christian Faith Publishing, Michael Campisi’s new book is a profound compilation of insight and reflection as the author attempts to get into his son’s head and understand why, and in the process finding ways for a parent to deal with the immense heartache of watching a life full of promise and value wink out. Campisi bares all and keeps the challenge real, standing strong in his integrity and support system, while powerfully speaking to teen suicide awareness and sharing original poetry and songs that have provided commiseration, healing, and counsel along the way. View a synopsis of “Walks in the Dark” on YouTube. Consumers can purchase “Walks in the Dark” at traditional brick & mortar bookstores, or online at Amazon.com, Apple iTunes store, or Barnes and Noble. For additional information or inquiries about “Walks in the Dark”, contact the Christian Faith Publishing media department at 866-554-0919.